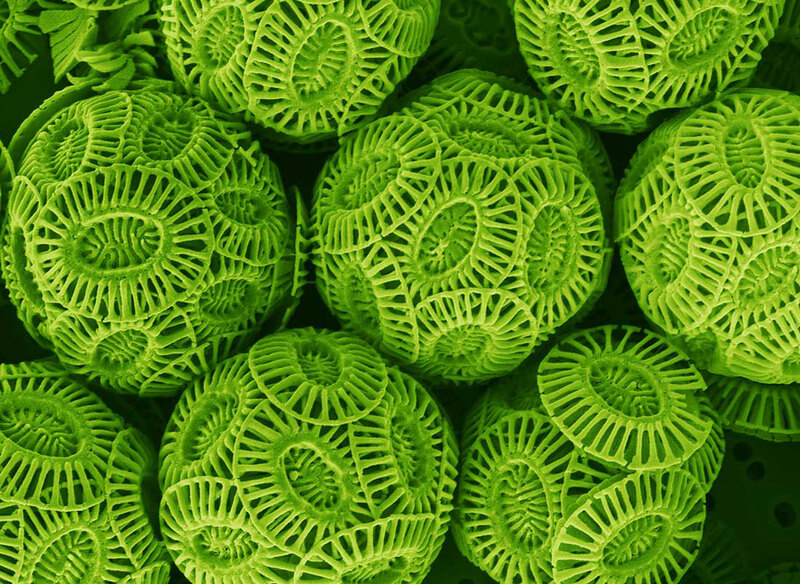 Coccolithophores, shown here under magnification, are food sources for small fish and zooplankton, and they also remove huge amounts of carbon from the ocean. They’re impossible to see with the naked eye. They’re difficult to pronounce. But coccolithophores, a single-celled plankton, have an outsized effect on oceans due to their sheer quantity — their blooms are visible from space — and because of the fundamental role they play in food chains and the carbon cycle. Small fish and zooplankton feast on them, and they remove huge amounts of carbon from the ocean. A quarter of the carbon dioxide humans put into the atmosphere ends up in oceans, where it reacts chemically and makes the water more acidic. This disrupts a variety of marine life, inhibiting some species — including corals, clams and other mollusks — from forming shells and skeletons. So as the threat of ocean acidification, which has emerged as a companion to climate change, looms large, scientists have become concerned that increasing acidification will jeopardize the health of these crucial carbon-absorbing creatures and add another lifeform to the list of species threatened by pollution. But research published in Nature Communications uncovered good news for coastal varieties of the plankton — those changes in ocean chemistry don’t appear to bother them. To test the resilience of the coccolithophores, scientists took live samples and put them in tanks of ocean water. They added extra carbon dioxide to the water — levels matching projections of how much could be in the ocean by the middle or end of the century. The plankton appeared to be utilizing the extra carbon dioxide in the water to grow. The findings stand in contrast to what was found in previous studies on open ocean species of coccolithophores, some of which were negatively affected by ocean acidification. Eagle suggested coastal species may be hardier because they’ve had to evolve to a variable environment, living in places where water acidity changes because of upwelling, ocean currents and other natural phenomena. He cautioned against too much optimism with the findings, however. Because of their place at the bottom of food chains, Eagle said, major shifts in the numbers and location of coccolithophores would likely affect creatures higher up — all the way to apex predators — which all depend on the single-celled creatures, directly or indirectly, for sustenance. Since coccolithophores are “carbon fixers” that take carbon dioxide out of the environment, some scientists and engineers proposed using them as a solution to global emissions and climate change, Eagle said. But that idea met with skepticism. As anyone who has ever owned a salt-water aquarium knows, oceans are complicated systems. Numerous other variables including temperature, currents, salinity, pollution and overfishing all affect marine life and ecosystems. Scaling up an operation that would use coccolithophores to make a global impact would present not just technological hurdles, but could negatively impact oceans in ways that are hard to predict. Learning more about the organisms is vitally important to understanding the interplay of climate change and oceans, said Yi-Wei Liu, the paper’s lead author. There are still a lot of unknowns, though more researchers are paying closer attention these days. “And we can use them to reconstruct paleoclimates,” she added. Finding out how coccolithophores reacted to changes in prehistoric climates could give scientists better vision of what may happen as our contemporary climate changes in decades and centuries to come. 1 Comment on "Carbon Filled Oceans Affect Tiny But Important Organism"